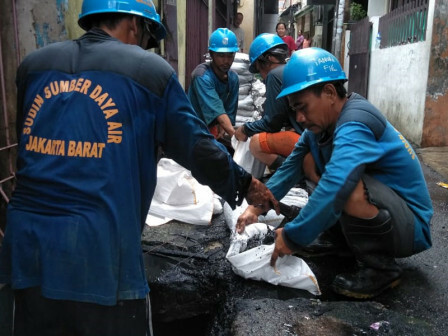 As many as 100 officers of West Jakarta Water Resources Sub-department have dredged seven water channels in Jelambar Baru, Tomang, Wijaya Kusuma and Tanjung Duren Selatan urban villages.
" This is to follow up residents' report and anticipate puddles"
They managed to pick up more than 40,000 sacks containing mud. "This is to follow up residents' report and anticipate puddles," disclosed Grogol Petamburan Sub-district Water Resources Executing Unit Head, Yusuf Kasim, Thursday (1/24). Those channels are located at Jalan Utama Sakti I, II, V and IX Wijaya Kusuma Urban Village, RW 09 Jelambar Baru Urban Village, Jalan Mandala Utara RW 06 Tomang, and Jalan Arjuna Utara, precisely on the side of toll road, Tanjung Duren Selatan Urban Village. "Dredging has been ongoing since a week ago. It is done up to the bottom layer of the channel, this is effective for overcoming puddles when heavy rain falls," he stated.